BRIEF FACT ABOUT YOUNG LAWYERS’ FORUM (NBA-YLF). The NBA young Lawyers forum is a platform for dynamic and resourceful lawyers within the post call bracket of 1-7 years, who are striving to make a difference in the legal practice. Bearing in mind that the NBA is the umbrella body of all lawyers in Nigeria, its operational structures include the young lawyers forum. The underlying objective of the forum is to articulate the welfare of young lawyers and address the issues concerning their welfare and professional development. These challenges range from undermining perceptions, economic decline to increasing competitive environment and limited opportunities for the latent potentials of young lawyers to thrive. These and many more affect the chances of a progressive career growth of the young lawyer. To address these challenges, young lawyers established the Nigerian Bar Association - young Lawyers’ Forum (NBA-YLF) in 2006 under the leadership of the then honourable NBA president OLISA AGBAKOBA S.A.N. The Forum is steered by YLF-Governing Council appointed by the NBA national executive with its headquarters at the NBA Secretariat Abuja for a term of 2years. The terms of reference of the executive apart from the general mandate of articulating issues concerning Young Lawyers welfare are set out in the Forum Bye Laws. Issa Adedokun Esq. 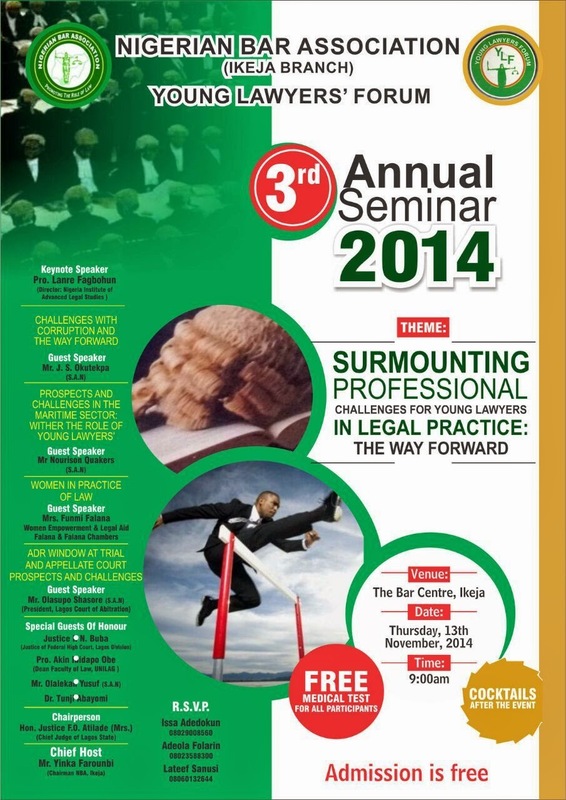 Is the current Chairman of the NBA Young Lawyers’Forum, Ikeja-Lagos.